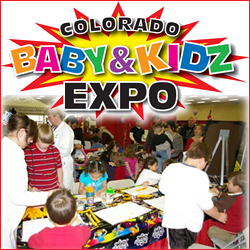 The annual Colorado Baby & Kidz Expo is DENVER’S ANNUAL FAMILY EXPO – “The Parent, Baby, Toddler & Child Expo”. This fun family event features great stage entertainment (Science Experiments, Magic Show, Diaper Derby, Toddler Derby, Karate and More!) In past shows we have had photo ops with Spongebob and Dora the Explorer. Parents will enjoy the family oriented vendors (Schools (preschool, charter, home school, afterschool), Camps, B-day info, Family vacations, Family Coupon.coms, Family type products & services, Theatre, Music & Dance, Entertainment, Health & Wellness & More! What makes this great is that we make this outing affordable for families!!!. Buy tickets on the website and save $$$ – discounts for 65+ and kids 12 & under are FREE. Yes you heard it correctly: F R E E.